Canada's territories are spending the most per capita on costs related to substance use, according to a report released Thursday. In 2014, Nunavut spent about $96 million related to substance use; in the Northwest Territories that number was $102 million, and in the Yukon, it was $71 million. The study, a collaboration between the University of Victoria's Canadian Institute for Substance Use Research (CISUR) and the Canadian Centre on Substance Use and Addiction (CCSA), was funded by by Health Canada. The costs are associated with the criminal justice system, lost productivity, health care, and other "direct costs," like fire damage or substance use studies. The researchers used large databases of information, including the number of people admitted to hospitals, visits to general practitioners, and prevalence of substance use. 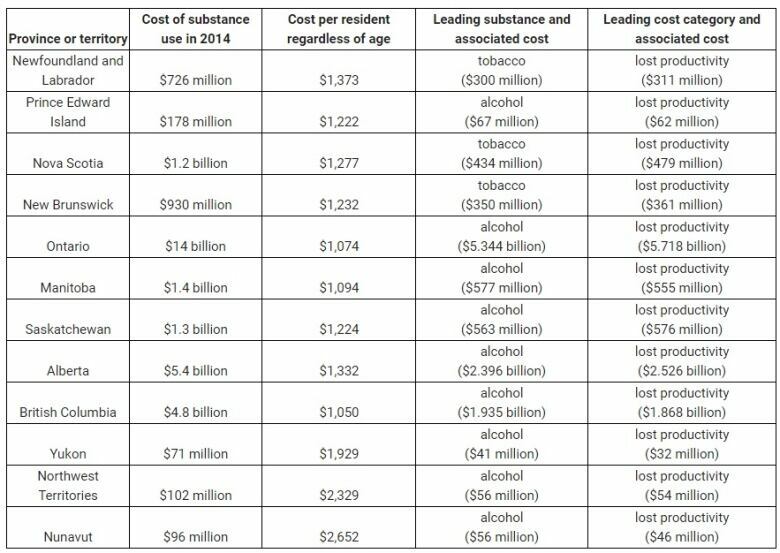 The cost of substance use per person in Nunavut for 2014 was $2,652; comparatively, the highest cost in a province was Newfoundland and Labrador at $1,373 per person. The lowest cost per person in Canada was in British Columbia, where final figures came in at $1,050 per person. Overall, six provinces spent upwards of $1 billion related to substance use in 2014, with Ontario spending the most at $14 billion. The numbers for Quebec are not all in yet, as the researchers only recently received some necessary information on hospitalizations. Tim Stockwell, the director of CISUR, said the high costs are mostly related to the use of legal substances: tobacco and alcohol. "The main lesson I think is that despite the terrible opioid crisis we're having, it's still the case that the great majority of harms … are from our legal drugs," said Stockwell. He said the territories have a higher cost associated with substance use because of a higher prevalence of alcohol and tobacco, and a higher cost of living. 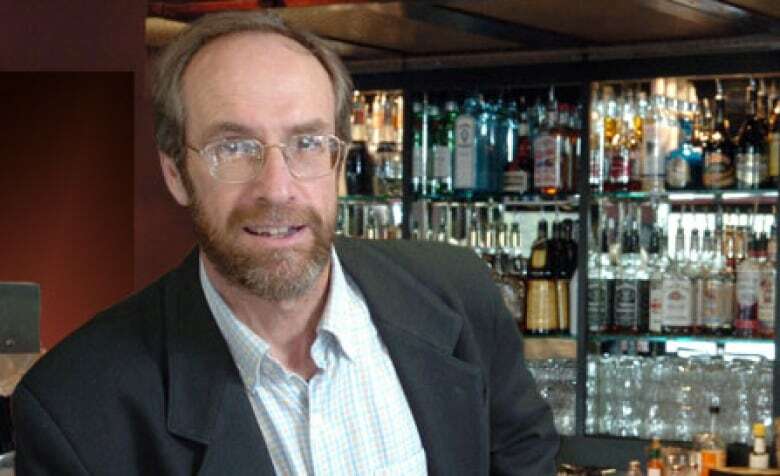 "Those are really costly substances that create an awful lot of harm both in the health sphere and the crime sphere, for alcohol at any rate," said Stockwell. What is causing N.W.T. 's 'dramatic spike' in alcohol-caused hospitalizations? According to the report, substance use led to $54 million in health-care costs in the Northwest Territories in 2014, $46 million in Nunavut, and $32 million in Yukon. The goal of the study is to help shape policy, said Stockwell. "We need to put substantial attention at the highest level to reduce harms from our use of legal substances," he said, adding that it needs to be in tandem with a continuous effort to combat the harms associated with opioids and other illicit substances. He said that CISUR recommended imposing a minimum cost of $1.50 before taxes, per dose of alcohol — for one ounce of liquor, or for one regular sized beer — at liquor stores. Stockwell says he also sees issues in the way legal substances are advertised, in particular on social media. CISUR plans to release another report in 2019 examining alcohol implementation strategies, with one focus being firmer regulation on alcohol advertising over Facebook. 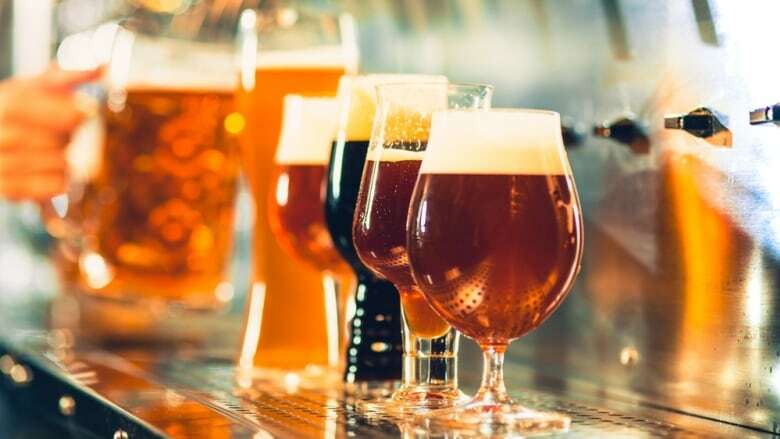 Stockwell said that right now, promotions on Facebook and Instagram promote unhealthy and inappropriate use of alcohol, because they are not regulated in the same way as TV and radio advertisements. He also said that he expects cannabis-related costs to decrease with legalization, in particular when it comes to the justice system. The next phase of this project will be to release substance use data for 2015 and 2016, as well as launch an online tool that the public can use to access the most current data on substance use, which Stockwell says he expects to have live by early 2019. Stockwell said the 2015 and 2016 numbers should be interesting because "2014 is the beginning of many things," including alcohol deregulation, the development of tobacco alternatives, the opioid crisis, and the legalization of cannabis. "It's incredibly important that these trends are monitored going forward," he said. Jamie Malbeuf is a reporter with CBC News, based in Fort McMurray. She started her career with CBC in 2017, after graduating from MacEwan University with a major in journalism. She covers a range of topics including health, justice, and housing. Follow her on Twitter @JamieMalbeuf or email Jamie.Malbeuf@cbc.ca with a story idea.